Do u think there should be a Sonic onyesha with Julie-Su in it? is Julie-Su your inayopendelewa Sonic girl? Doesn't it bother wewe that Julie-Su is only loved kwa one guy? Julie-Su is a Mobian Echidna and the girlfriend and distant releative of Knuckles the Echidna. Born the daughter of Luger and Mari-Su, Julie-Su was brought up amongst the Dark Legion. After her parents were murdered kwa her half-sister Lien-Da she was placed in the foster care of Simon and Floren-Ca before she was taken away from them as well. 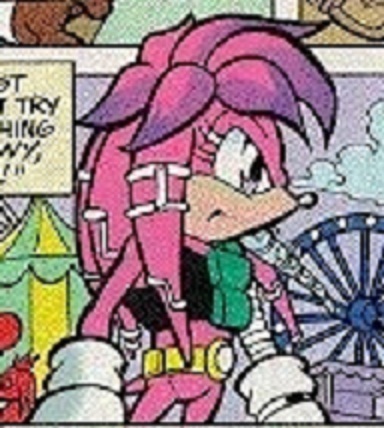 Serving as a support troop in the Dark Legion for years, she eventually left it to jiunge Knuckles and his group, the Chaotix. Since then she has fought along Knuckles' side and continues to function as a key member of the Chaotix.